Although a variety of drops can happen at any time, one thing I try to watch for as a signal of extreme danger is when everyone thinks that stocks are a "sure thing". At the moment this seems a bit hard to figure out. I don't hear a lot of commentary saying that stocks will always go up and they make so much money that no one should miss out. 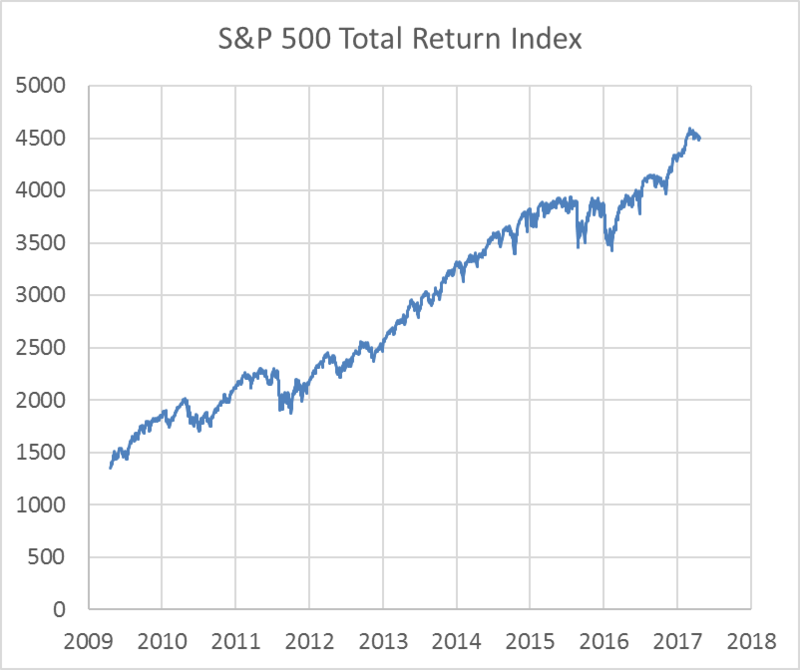 On the other hand the economic realities of low interest rates are forcing a lot of people to invest in dividend-paying stocks when they know they aren't prepared for the risk. It's possible that this is some new kind of fear-driven euphoria. The combination sounds irrational but apparently the "stagflation" in the 70s did too. @Richard: Many believe that there are times when an imminent stock market crash is predictable based on widespread euphoria among those who know little. This is based on 20/20 hindsight. After a crash has happened, it's easy to look back and delude ourselves into thinking that all the signs were there. But it's never obvious beforehand. Whatever the state of people's thinking right now, I don't believe we can profitably predict the timing of the crash. @Michael...sounds like having cash as a portfolio component rather than being fully invested in ETFs is now part of your strategy. It wasn't always, but it seems that you're changing your tune. Good for you! Cash is valuable when others are selling in panic. Having cash when securities and assets are on sale allows you to put money to work at vastly improved rates. If you think of all assets as providing a cash-on-cash yield, having securities "on sale" or at "increased yields" (because their purchase prices are reduced) is advantageous. We put our remaining cash to work in 2009 and 2010. That single timeframe has provided significant compounding (~20% annualized) which we have occasionally harvested to build our cash component. Having cash available for these opportunities requires discipline, long-term thinking, and the ability to forego some short-term returns. We tend to lag the indices as we get deeper into the market cycles, but out-perform when markets crash and out-perform when markets recover simply because we hold cash and buy when securities are "cheap" and providing improved cash-on-cash yields. We can't predict the future and don't try. We do manage an unleveraged portfolio and we do have an understanding of how to value securities. We don't try to prematurely stop compounding, but also don't hesitate to convert over-priced securities into cash to take advantage of other investors' exuberance. Good to see your thinking evolve and improve! Keep writing, please. "investors should consider safe investments for any money they might need in the next three years. More conservative investors may choose five years instead." This is the reason for my cash position. This cash is there for living expenses and not reinvestment in the market. I have no intention of trying to time the market. The average investor who keeps money on the sidelines waiting for cheap stocks loses more in opportunity cost than he/she gains in buying stocks when they seem low. You could almost replace "stock market" with "Canadian real estate" and the chart and article would look quite similar. Unfortunately, I think it will take a real estate crash for most people to truly realize that housing does not always go up (many have never seen one) and that it should not be the only component of someone's retirement plan. @UI: Interesting observation. I've never thought of my house as contributing financially to my retirement plan, but others do. No doubt the next real estate crash will be a real eye-opener. 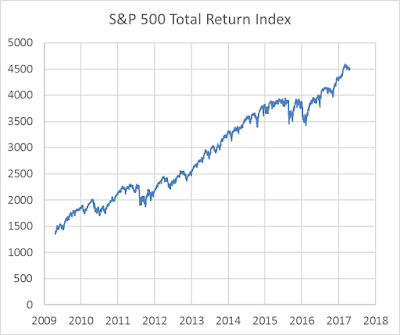 I guess in the aggregate the S&P 500/Dow index (aka "the stock market") does only go up, just as almost all airplanes reach their predetermined destination despite being off-course for the majority of the flight; and re-examining the posted chart, there are many instances of 'down' during the last eight years. "It’s hard to know what you can handle unless you have lived through a crash..."
For this I take a page from my time as a competitive cyclist. As the basic tenant goes, if you ride, you will crash. Thus, as part of my training, I practiced crashing -- on purpose (albeit only on grassy fields and not on bone-breaking tarmac). It conditions both the mind and body to not only be aware of possible crash situations, but to react as calm as possible when involved in an actual crash. One thing you learn is that exceptionally few crashes are life/career ending. If nothing is broken, crashing, be it on the bike or in the market, is merely an issue of pain management. @SST: As long as you don't sell during a crash, history suggests that you'll be back up at some point.